They say the shoes make the outfit, so I couldn't do a pirate costume without making the boots, right? If you have been following this series, you will know that I have been making my 3 year old Sweetheart his halloween costume and I've dedicated myself to not spending any money on the project, because I actually have everything I need in my fabric stash. These cute boots are no exception. I bought the black vinyl probably around 5 years ago from the remnants bin of the fabric store intending to make a bag or something with it. All this time it's been sitting in a box rolled up with the price label still on it. But now at least part of it will be little boots. Well, ok, they aren't really boots. They are more boot shaped covers. They just sit on top of a pair of sneakers pretending to be boots. Real boots are, um, a little beyond my expertise (especially for my kid's Halloween costume). Now I have some really cool news. Brace yourself. While I was creating this pattern I was wondering the whole time how I was going to tell you how to retrace my steps and make your own pattern. Then I realized that that would stink. For me and for you. So I made a PDF pattern for you to download!! Aren't you excited? How about when I tell you it's free? All right I can feel it. Now you're excited. Before you download this pattern please note: This is a toddler size pattern, it fits roughly size 8 to 10 shoes. If you are unsure if it will cover your child's shoes, before you cut your fabric, place the "toe" pattern piece over the top of your child's shoe. It should fully cover the toe of the shoe. Pirate Boots Pattern It'll take six sheets of paper. Don't forget scissors and tape to reconstruct it. Download and print off the PDF, remember to print 100% to scale. To insure that it's to scale, I have included a box on the first page that measures one inch square. It may be best to print off just that first page alone to make sure it's right. Cut out all the pieces and piece the sections together to make the four whole pattern pieces seen below by matching up the like colored lines and taping. 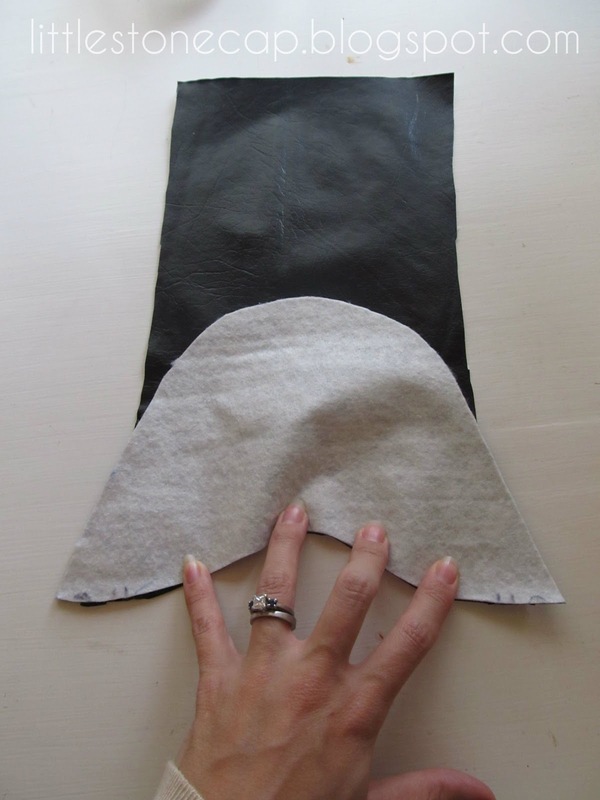 Place the pieces on your folded fabric and trace and cut out. Remember to put the "cuff lining" piece on the fold, and cut out 2. Also make all the markings on the pattern edges on your boot pieces so you can line them up more easily. Match up the "toe" piece to the "boot front" piece by using the triangle markings, pin, and sew right sides together. Starting with the left side of the boot, line up the markings on the "back" piece with the corresponding markings on the "toe/front" piece you just made. Pin, and sew right sides together. Then do the same on the right side, but stop sewing four inches below the top of the boot. These pieces do have to be eased a bit because they have curves. On the second boot start with the right side, then sew up the left side stopping four inches from the top so the two boots are opposite. With right sides together, pin the "cuff" piece to the top of the boot. Start sewing up one side, sew across the top, and then sew down the other side. Clip the corners of the cuff, and turn, making a crisp edge and corners. You may also wish to top stitch the edges so they are flat and crisp. Machine or hand tack the bottom of the cuff to the boot if it won't lay down when you fold the cuff down. The stitches will be hidden by the cuff. Then to finish the second side seam, sew up another inch and a half (or just a little over the cuff lining) . Don't sew all the way up to the top of the boot so you can fold down the cuffs. Make sure your two boots have their cuff openings on opposite sides! 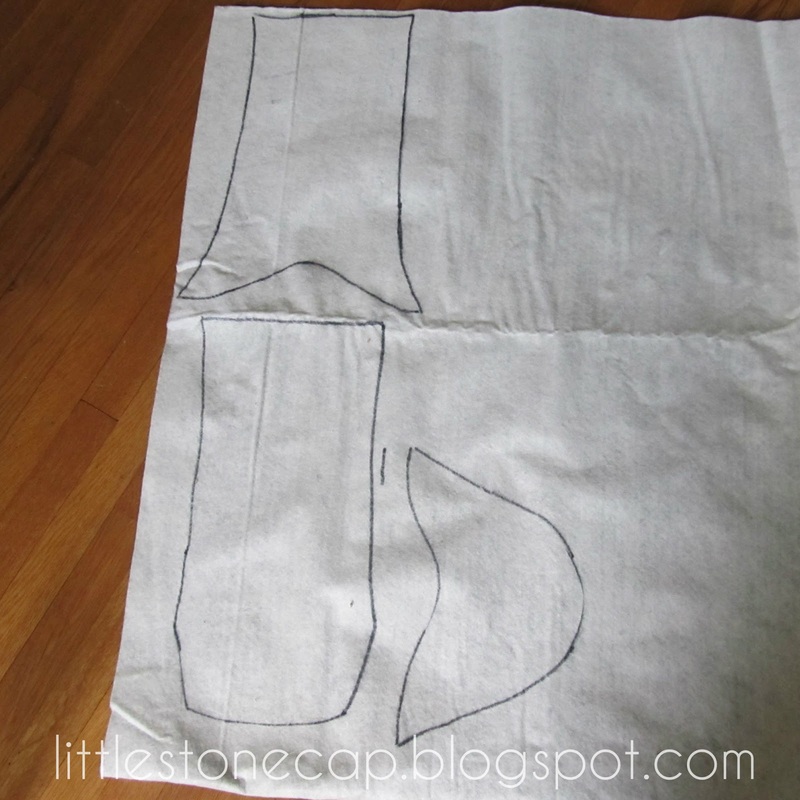 You may wish to fold and hem the bottom edge of the "boot" Please try it on your little pirate's shoed foot first to make sure it will still cover it when hemmed. YAY! Now you have boots! These are big enough that your pirate can just pull them on without needing to unfasten the sides, and the fabric it stiff enough that they will stay up without needing to be too tight. Especially if you stuff the cuffs of their pirate pants into them. :) Please give me feed back on my first PDF pattern. I love to hear from you. Need the rest of the pirate costume? Click these links for the shirt, and pants, and vest. You are a genius! Thanks for the free pattern. I think I'm going to try it this weekend! You're welcome! Hope it works out well for you. I just finished these boots for my son's Link costume, and I had to scale down the pattern a bit since he's only in a size 6 shoe, but they worked great and he looks soooo cute in them. Thank you so much for making the pattern and putting it up for free. Thank you for the pattern! I am going to attempt to make these for my son's Jake costume for Halloween. Thanks for the pattern...we are taking our grandchildren on the Disney cruise soon and I am making pirate costumes for "Pirate Night". These boots will be the icing on the cake for their costumes! Thank you, just made these for my little guy to be "Jake" the pirate this year. Put elastic across the bottom to try to pull the foot part down and it looks like it will work wonderfully. Thanks so much! 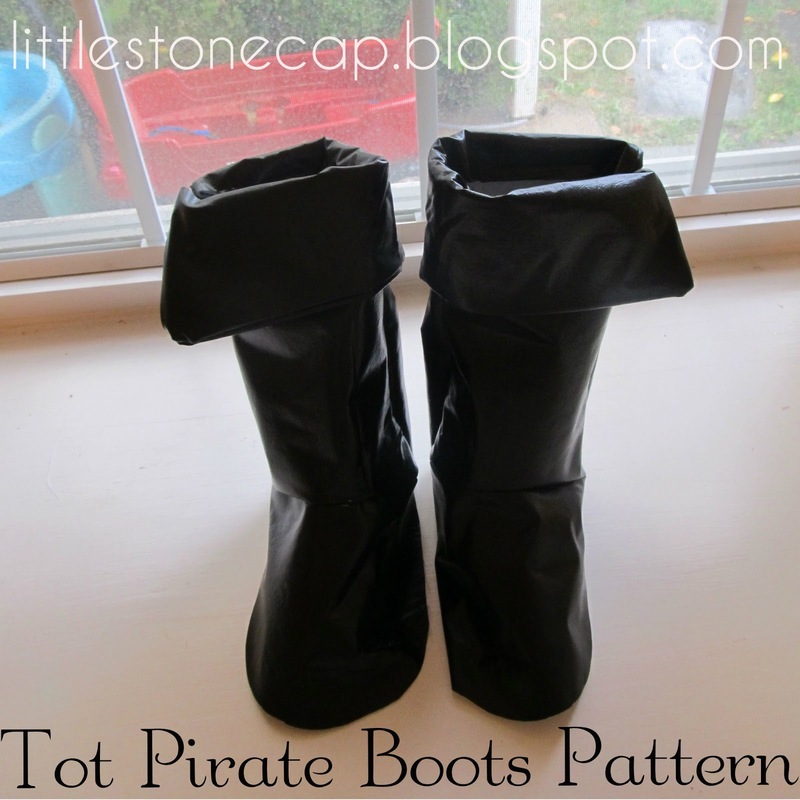 These are awesome and will complete the pirate costume I'm making for my three year old son. I've already made the jacket and the pants. Thank you for posting a free pattern!! I pinned it on Pinterest. What that means is that the fabric is folded in half when you are cutting your pieces out so that you cut everything out two at a time. But the cuff piece needs to have its edge lined up with the fold of the fabric so that when it's cut out and unfolded it is the correct size. In this case you will have to remember to cut it out twice so that there is a cuff piece for each boot. In the picture just above step 3 the fold of the fabric is at the bottom of the picture. Unfortunately I hadn't traced the cuff piece yet when I took the picture. But it would have been there at the bottom of the fabric butted against the fold. Thanks for the easy pattern, Deborah! I started on the boots last weekend, but as three year olds will do-my time was stolen off and on, which delayed finishing them until this morning. :-) I'm just a novice seamstress, so I had a couple bumps in the road that I wanted to post a comment on. First, must be my sewing skill level-but I did not understand the term "easing" and had just sewn the pieces together flat. I realized my mistake by Step 5, when I mistakenly sewed the back on to both the front AND the toe piece and nothing even resembling a boot was the result after turning pieces back out. So I took out my stitches back to Step 3 and "gathered" the toe piece onto the front piece, turned out the toe piece (so I was not sewing it to the wrong place on the back, and gathered the bottom part of the back, front and toe pieces together when following Step 5. The cuff piece instructions also had me confused, but after re-reading about four times-it clicked and I went ahead just as you posted and turned out the cuff and folded down. It works! Just found this on pinterest and you are saving me so much headache for my son's Halloween costume. He is a size 9 so I feel like it was in the stars for me to find this. :) Thank you so much for the free pattern! Thank you so much for this pattern!! I need superman boots and I think this will serve as a base! I tried it on my own and they were a disaster so I really appreciate you making and sharing a pattern. Would you have any suggestions for how to scale this pattern - when printing - to make larger sizes? I'd like to make 2 pairs, one for my son who wears an 11 and one for my daughter who wears a 13. Thank you!! This pattern might actually fit over size 11 shoes if you don't hem them. My younger son is a size 11 now and they still fit over his shoes. But to answer your question, print out the pieces and cut them out. Cut the toe piece in half widthwise (across the widest part). You can add the extra length you need by taping an appropriately sized strip of paper between the two toe pieces and trim the edges to follow the original curve of the pattern. If you find that they are also not tall enough, you can do the same thing to the front and back pieces. Just make sure you add the exact same amount of length to both pieces so that they match up when they are sewn. The width of the boot should not be a problem. They are quite wide already. Thanks so much that's very helpful! I used this pattern two years ago and I'm back!! Great pattern. Still love it. So do the twins!! Time for pirate's weekend at Renfest! What an awesome complement! Thanks! Have fun at Renfest!! My son is going to be prince Eric. My daughter will be Ariel. This and your pirate shirt tutorial are perfect!!! Thank you! Yes. I would scale them down a bit in width. I made them wide enough to fit over pants and the material is stiff enough to stand up straight so it's not a necessity, but thinking of my own two year old I think they would be a little loose as is. Ok, so I took off half an inch from the width and two inches from the height. But does it make sense that the back boot piece is taller than the front piece? Also, when measuring where it will come up to on my son, should I go according to the back piece? Thank you so so so much!! Yes. The back piece is longer. When you attach the front piece to the toe the whole front should be the same length as the back. The toe piece adds to the length at the bottom sides. So yes, measure according to the back piece and take the same amount of length from both pieces. Are seam allowances included in the pattern? If so, how much are they (1/4", 1/2",...)? I am so excited to make this! 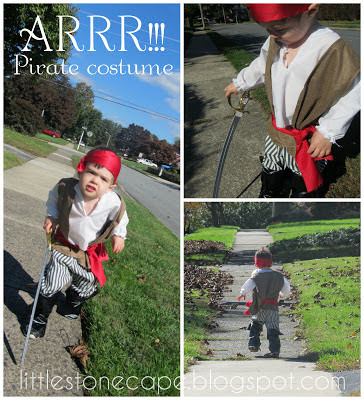 My son wants to be a pirate for Halloween, so this is perfect timing! Thank you!! Yes. The allowances are included. They are 1/4". Have a fun Halloween! I am no seamstress and don't even have a sewing machine (try not to laugh too hard), so is this possible to do this with fabric glue? I don't know. You might be able to do it with fabric glue but it's not something I've used much so I can't attest to its strength especially on vinyl fabric. But as I was thinking about it, the thought occurred to me that you might be able to tape the pieces together with black duct tape. Or if you know how to hand sew, they would go together very nicely by hand as well. Good luck! I was thinking about using felt. It only needs to hold together for a few hours. Hi! The easiest way to scale this pattern down would be to make it as is and then trim the sides and toe down so that it just fits over the child's shoe. However if you want to scale down the entire boot, then you'll have to cut each pattern piece in half lengthwise, trim off probably about 1/4-1/2 of paper from the middle of the pattern, then tape the two sides back together. Follow the rest of directions as is. Fit the finished boot over the child's shoe and trim the toe to the proper length. I hope that made sense. Thank you!! I modified this and made a super cute pair of moccasins for my 8-year-old. Added fringe, no cuff, just the front pieces and ties in back. I so appreciate the pattern pieces. 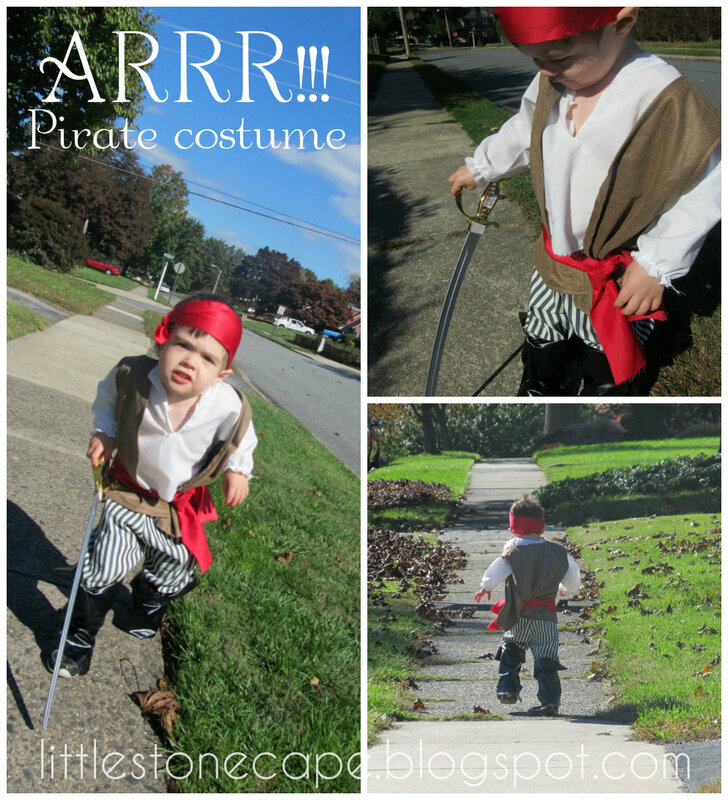 Thank you so much, I have a newborn that I made this whole pirate outfit for and i am not very good at sewing. So i found you instructions and print outs so helpful! Couldnt have done it without you. Thanks for stopping by! My name is Deborah. I love my life and want to share my beautiful family, home, and interests. 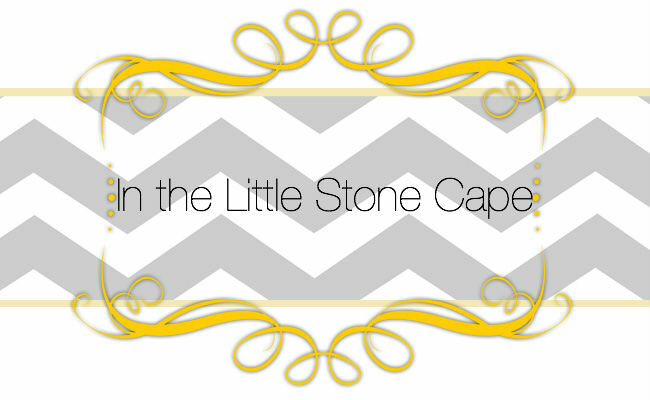 I hope you enjoy peaking into our life and what goes on In the Little Stone Cape. DIY Kids' Halloween Costume Series!